Mahatma Gandhi had once famously said “sanitation is more important than political freedom.” This statement underscored the criticality of sanitation in society. Inspired by these words, the Hon'ble Prime Minister of India gave a clarion call to the Nation to fight filth and open defacation, change old habits and achieve a Swachh Bharat by 2019, to mark the 150th birth anniversary of Mahatma Gandhi. As a part of this camapign Swachhta-Hi-Sewa Pakhwara has begun today on Konkan Railway with a Swachhta Pledge by Konkan Railway Employees with a view to raise awareness amongst the employees and their families to inculcate the habit of cleanliness in their routine life and work place. 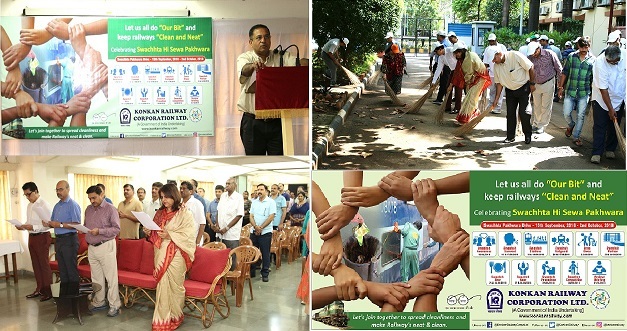 Seen in the picture Shri Sanjay Gupta, CMD/KRCL alongwith executives and staff of Konkan Railway taking a pledge & doing “Shramdan” on the first day of “Swachhta-Hi-Sewa” pakhwara.